This has been rated as one of the best Rifle scopes out there. 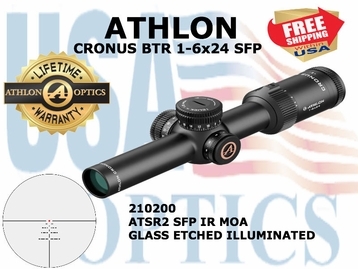 Whether you want 3 gun competition, tactical applications, or even your hunting adventures, the new Cronus BTR rifle scope is just what the doctor ordered. The ATSR2 SFP IR MOA reticle is specifically designed for 3 gun competition (68 grain hornady and 69 grain sierra cartridge) and any Nato 5.56/.223 caliber rifle with hold over points for both bullet drop and wind. The 1.4 moa red dot is perfect for zeroing your rifle at 200 yard and the open centers below the center red dot are for targets at 300, 400, 500, and 600 yard. The unique design of open centers does not block any 12~18 inch targets beyond 200 yards and allows a shooter to take a quick shot once a target fills up the gap in the middle. The openings on horizontal lines below the center are specially designed for holding over 5 mph and 10 mph wind. ✔ HD Glass - HD Glass gives you better light transmission, brighter, and sharper image. ✔ Illuminated Reticle - The illuminated reticle provides greater visibility during dusk and dawn and other low ambient light environment. ✔ Etched Glass Reticle - Reticle etched on the glass that provides excellent backing support for complex reticle design and offers great durability and much higher shock resistance to recoil. ✔ Advanced Fully Multicoated - Fully Multicoated optics effectively reduces reflected light and increases the transmission of light giving you a brighter image than normal single coated lenses. ✔ XPL Coating - XPL Coating gives you an extra protection on the exterior lenses from dirt, oil and scratches or anything else mother nature can throw at you. ✔ High Precision Erector System - The high precision erector system processed by high precision CNC machine with +/- 0.0001mm tolerance level to provide you the most accurate power settings and smoothest magnification change. ✔ 6061 T6 Aluminum - The 6061T6 aircraft grade aluminum tube that has exceptional strength and superior mechanical integrity will protect these world class optics no matter what punishment you throw at it. ✔ Exposed Tactical Direct Dial - Exposed Direct Dial Turrets for elevation and windage allow you to quickly make adjustment as you needed and engage your target within a blink of your eye. ✔ Locking Turrets - This Locking Feature allows you to push down to lock the turret and pull up to turn. This feature prevents the knobs from being turned accidentally and keeps your zero all the time. ✔ One Piece Tube Construction - Heat treated one piece tube gives the scope extra strength over multi-piece tubes. A one piece tube also is better at keeping moisture out thus keeping your scope fog proof for the life of the product. ✔ Waterproof - Waterproof to protect the scope in the harshest weather conditions or if accidentally submerged underwater. ✔ Fog proof - Fog proof to allow you to immediately engage your target when you take your rifle to cold ambient temperature from warm inside. ✔ Shockproof - Robust mechanical system with special designs on both control and erector system that give you the ultimate recoil resistance to withstand 1000G recoil for 1000 times. ✔ Argon Purged - Argon Purging uses the inertia gas with bigger size molecules to purge any moisture out of the tube giving you better waterproofing and thermal stability. » Eye Relief - 3.6-4.0"
» Weight - 18.8 oz.